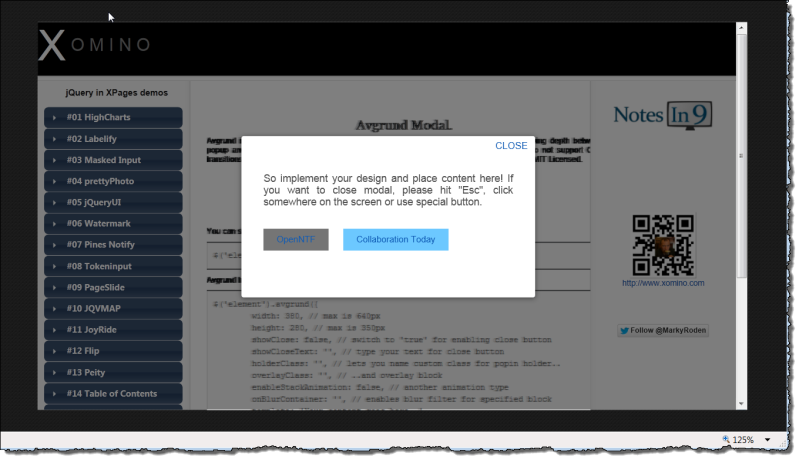 In this article I will describe how to implement and use the Avgrund modal dialog which uses CSS transitions to give the effect of depth between the dialog and the page. 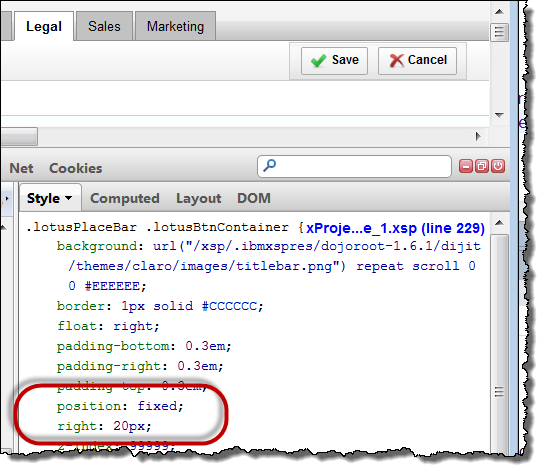 It is hard to believe that it has been two months since the last jQuery in XPages article – and for that I apologize. My current project requires most of my time to be away from the XPages DDE and as such the opportunity to find new and exciting plugins is decreased. But I came across this one today and figured I would take the time to write it up. Avgrund is a very simple 2k jQuery plugin which uses a CSS transition to shrink the visible page while displaying a modal dialog to the user. This gives the perception of depth between the page and dialog and a neat visual transition between the two. The plugin also uses IE alpha filters to fail back for IE<10 browsers which do not have CSS transition support (nice touch). We add the jQuery library and the avgrund.js library file to the database by adding them to the Web-Contents folder accessible via the package explorer. (Window–>Show Eclipse Views–>Package Explorer) and drag and drop the two libraries from your computer into the “js” folder. We add the libraries to our XPages like this in the source panel – the avgrund.js also comes with two sample CSS files for the demonstration. holderClass: '', // lets you name custom class for popin holder.. The CSS transition is contained within the avgrund.css file and amongst other things scales the page to 0.9 of it’s size when active. A blur effect is also applied for greater visual effect. In this case the element in question is the Show button. I have a Ph.D in Chemistry (yay me…). I spent 3 years making many previously undiscovered compounds and characterized them! What I created and the papers I published were no use to anyone as far as I knew at the time – but in the future if someone else who I will never know needs to create a chemical with specific properties, my papers are out there and will help. In the same way that my research depended on those who came before me – my research will help those who come after me. It was the purest form of research. There was no company sponsoring it, needing results to justify their investment. It was funded by a purpose and a desire to further knowledge – which is what I did………That mindset is how I approach blogging. This post is aimed at the staggering amount of Notes/Domino people who are doing really cool &^%$ every day and want to share but have way to many inhibitions to do so. “Noone cares”, “I can’t write”, “I would be wasting my time” – whatever! Don’t be selfish – you learned from others after all…. Don’t be so selfish and keep everything to yourself………after all you are reading this and you know the benefit of learning from others – give something back once in a while. Call be a raving socialist but I believe that we as a whole community can be better as a whole when everyone shares their knowledge. You learned from others and took their ideas and modified them to make it your own…………. I think (as the title suggests) you need to understand is that it doesn’t matter what anyone else thinks about your blogging – it is all about what you think and more importantly about what you do to share it. Even if it is as simple as – I came across this cool idea the other day but I don’t know what to do with it, people will read it, people will contribute, people will benefit and people will make you better. I wanted it to help me get ahead! and it worked! – not because it made me any smarter, but it made more people aware of my skillset. I don’t care if people read the blog or not (liar) and I more importantly want to give back to a community which I have been taking from for over 10 years and anything I can do to help another developer is time well spent. There is no bigger rush than knowing that something you wrote about helped someone else – try it, you’ll be surprised! Don’t worry about what other people think…….. If you want a voice but don’t want to manage a blog, let me know and I will help you publish. If you have a voice – use it. Stop giving a &^%$ what people think about what you say – you’ll be surprised how appreciative they are that you took the time to do something for them ! In this article I will show how your ExtLib Application Layout Control action buttons (OneUI) can remain on the page at all times with a simple CSS Trick. The following was created using the Extension Library Application Layout control – with OneUI v2.1 using the silver theme. OneUI is a great, simple layout for a nice clean application layout without too much worry about CSS and other complicated design things. There are some nice examples on the OpenNTF site about using the OneUI layout. The http://xpages.info/XPagesHome.nsf/Home.xsp website uses the same layout and you can see for yourself how the top bars scroll out of the screen as you move down the page. The buttons in the PlaceBar stay put as the page scrolls down – as the page gets larger this becomes more of a pain for the user to have to scroll back to the top to get to the Save button. My requirement in modernizing my current R5 web based application was to keep the look and feel as close to the original frameset as possible. The buttons were in the top frame and therefore visible on the page at all times. Without wanting to revert back 15 years and use frames in the XPage I had to come up with a way to keep the buttons on the page at all times.